Have yourself a crafty Halloween | eat. play. sleep. It’s no secret that one of the reasons I love being a stay at home mom is that I love arts and crafts. As soon as Ava could sit in her high chair, we were finger painting, and I probably let her have crayons at too early an age. Now that she is older, she can do more complex crafts, while Emily does the finger painting (although, Emily is a lot more oral than Ava was, and she eats more paint than she puts on the paper!). This week, we’ve had some fun making leaf rubbings, decorating paper pumpkins and bats to hang in our windows, and coloring fall and Halloween themed coloring pages (I *heart* the internet!). I had a momentary freakout when my favorite website was down for some reason on Monday – it’s where I get a lot of the patterns I use (they’re all organized by seasons, holidays, and other themes). Luckily, they were back up by Tuesday morning, but the pumkins that Ava and I decorated on Monday just weren’t as cute as the ones she did today with her friend Scott (using the handy pumpkin pattern!). 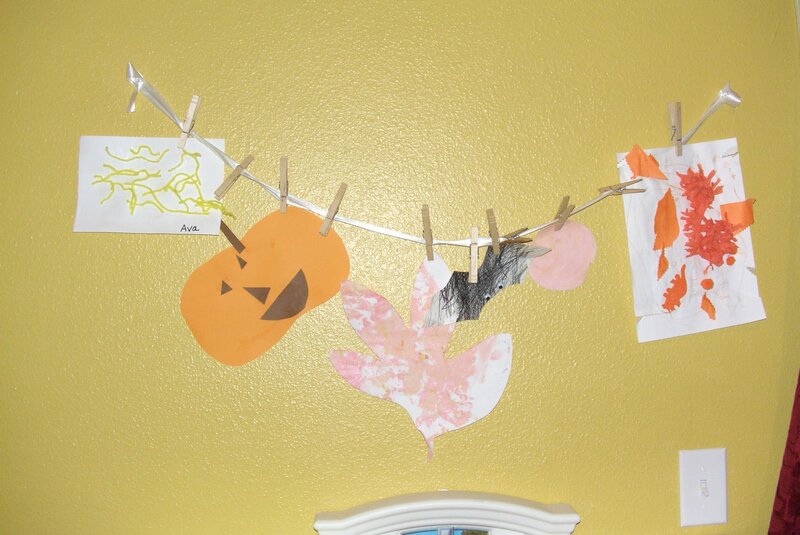 What kinds of crafts are you doing with your family for the fall holidays? Great ideas! I’ve bookmarked those links (you don’t know how much trouble I had finding a basic pumpkin outline the other day!! )Ellie’s been having great fun with these paper leaves and liquid watercolors from Discount School Supplies (my FAVORITE site for craft supplies):http://www.discountschoolsupply.com/Product/ProductDetail.aspx?product=17233At first I was astonished that the smallest package they sold was 72 leaves but we’ve all had so much fun with them that they’ll be gone in no time.We also have been decorating pumpkin printouts as jack-o-lanterns, making garlands out of decorated construction paper leaves (paint, markers, glue, glitter, pom-pom caterpillars, cut-outs, etc. used to decorate), and have gathered leaves/chestnuts etc from daily walks to make a leaf wreath (lots of leaves around here! ), rubbings, press between wax paper, etc. 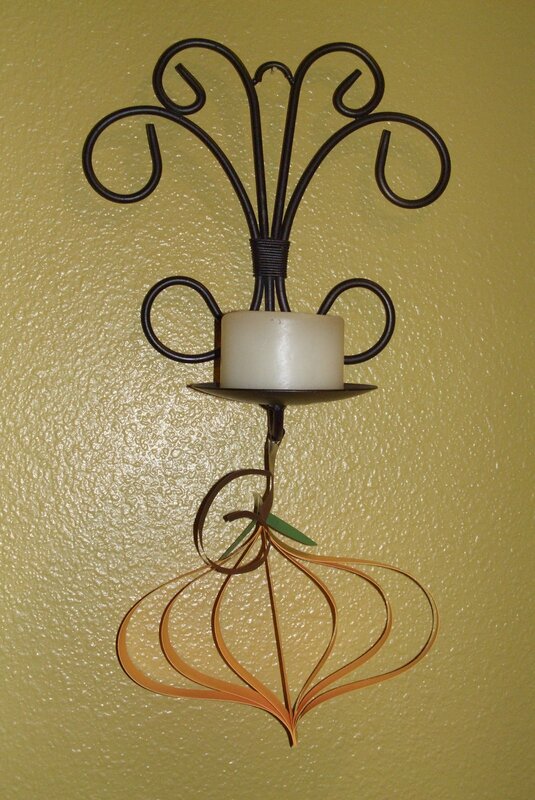 It’s not seasonal, but we’ve created a few too many homemade spin-art masterpieces (in the salad spinner) and are running out of wall-space to display. I recently started a ‘portfolio’ for E as an excuse to file away some art that we don’t have room to keep up, but I still want to keep for now. She loves adding things to it and flipping through it (just a 3-ring binder filled with clear sheet protectors and old photo insert pages for smaller items). 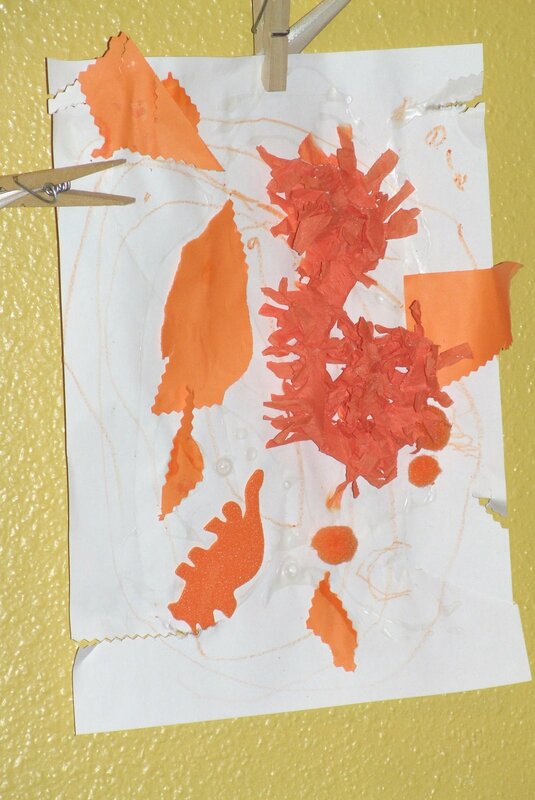 One of my fave Halloween projects I did with the kids last year was ghosts made from white footprints on colored paper…(heal as the head and toes were the ruffly bottom) the kids then decorated the paper with other Halloweeny things. Super cute! I hung them up again this year and will probably do a different variation this year…like a ghost fam with each of our feet on one big paper. We also did ghost milk jugs over our outside walkway lights… spooky! (think I got these from Family Fun) Anyhow, love Halloween-so many fun craft projects!!! !